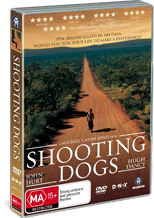 Shooting Dogs is based on the real-life massacre of 2,500 refugees in 1994 by Rwandan authorities. The story of this real-life massacre is portrayed through the eyes of two British citizens, a priest played by the impressive and sometimes malevolent John Hurt and Hugh Dancy, an idealistic teacher who struggle to witness how the world fails to intervene. Director Michael Caton-Jones brings forward a variety of global and moral issues in this heinous massacre which releases a plethora of issues to the viewer on how this atrocity happened. Hurt and Dancy are quite powerful in the film and at the end of the day, not from the acting or direction of the movie, Shooting Dogs leaves quite a sour and depressing feeling within the viewer which is probably what Michael Caton-Jones was trying to achieve.